Pack a lunch and snacks for the kids to keep energy levels up during the hike. Also, you might want to bring a carrier for small children. There are portions of this hike in Japan that small children will have no problems doing by themselves, but other sections of the trail might be too steep for young kids to walk themselves. It’s a long hike, so take lots of rest breaks and be prepared to possibly carry young children. We enjoyed this hiking trip in the late summer, but the leaves were already changing colours as if it was fall! The shade of the trees was perfect for a hot day, and we loved the many colours of the maple trees along our hike. This day trip for hiking Japan with kids is a great outing for a family looking to be active and spend time in nature while still soaking in the culture of Kyoto. Enjoy a train ride from Demachiyanagi Station to Kurama, with spectacular views of the countryside along the way. Then, hike to the scenic Kurama-dera Temple, and finally head over to the small mountain town of Kibune before calling it a day. With the many shrines and temples along the way, there will be plenty of opportunities to explore and learn during this adventure of Kyoto for kids. The Eizan Railway from Demachiyanagi Station to Kurama is an above-ground train ride that winds through the northern suburbs of Kyoto before entering a beautiful mountain valley. Kids of all ages enjoy riding trains and this one will be no exception. With incredible views for the parents and a fun train ride for the kids, this train ride is less about transportation and more a part of the journey to hiking Japan in Kurama and Kibune. DIRECTIONS You cannot connect to Kurama directly from Kyoto Station, but most people access it via the Keihan Main Line at Demachiyanagi. Alternatively, you can take a Kyoto city bus from Kyoto Station (number 4 or 17), but we enjoyed riding the train instead. TIP There are public restrooms when you arrive at the Kurama Station. Make sure to take advantage of these restrooms before starting the hike. The hike up to Kurama-dera Temple is a workout if you are carrying kids! It's steep with many stairs. Thankfully, you are hiking through a shady, old-growth forest with many small temple buildings, shrines and benches to stop for a rest break along the way. It took us approximately 40 minutes to hike to Kurama-dera Temple. It's worth spending a little time to soak in the beauty of the complex architecture and the views of the city below. DIRECTIONS Leaving the Kurama Station, you'll walk through a series of souvenir stalls. You'll then have the choice of taking a cable car part of the way up or hiking all the way to the Kurama-dera Temple. TIP The hike is quite steep, so bring a carrier for small children. Kibune is a charming little mountain town that is worth the visit. However, the hike there is a steep downhill trail. After exploring the town of Kibune, you will have one more decision to make - hike all the way back to Kurama or take a short bus ride to the Kibuneguchi Station, where you can get back to the main cities through the Eizan Railway. DIRECTIONS When you are ready to continue your journey, follow the hiking path along the left and then follow the signs to Kibune. 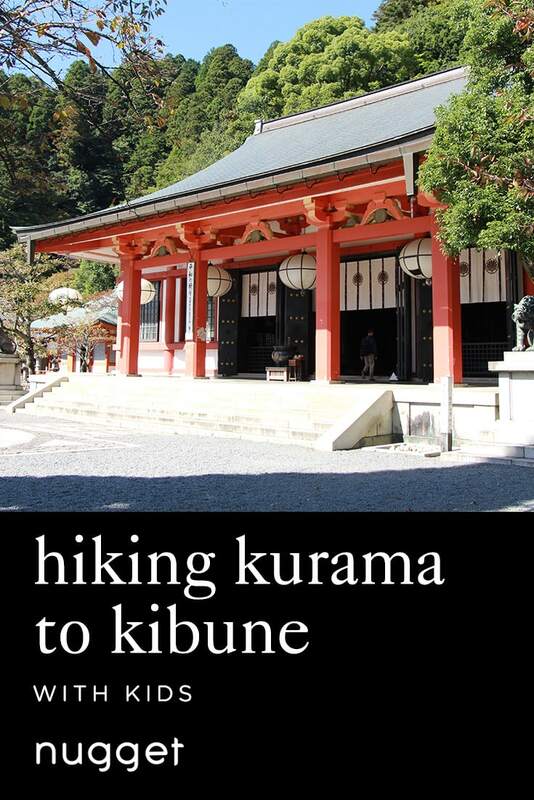 You'll find yourself at a point where you can continue on the loop back down to Kurama or complete your hike at Kibune. TIP Before starting your hike to Kibune, take a picture of the English/Japanese sign near the Kurama-dera Temple, as the signs past this point are in Japanese only. If you choose to ride the bus after visiting Kibune, bring pocket change for the bus ride to Kibuneguchi Station.